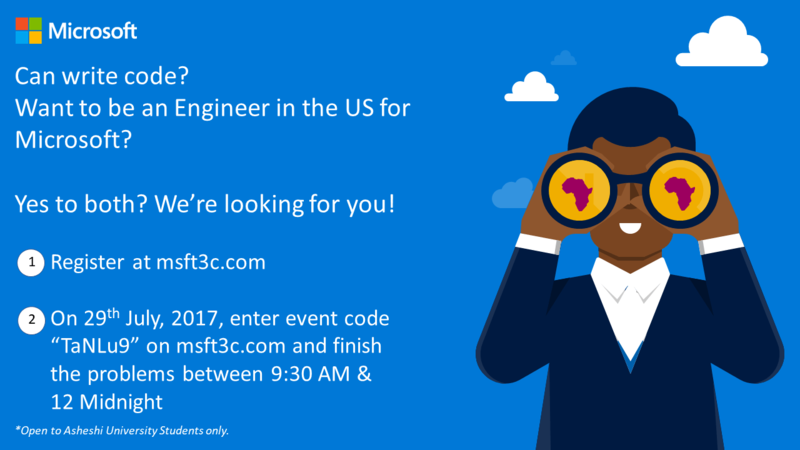 Home > Editor Picks > Africa to Redmond, Hack For Africa: Microsoft is recruiting Students for Engineering Roles. Update : For New Africa to Redmond Software Engineering Applications that apply to 2018-2019 kindly check from the home page or click here for list of related posts and choose you country or school. Microsoft is on a quest to recruit students into engineering roles at its Redmond campus. The initiative dubbed Africa to Redmond is set to take place in selected Universities across the continent. The initiative is part of an ongoing effort to recruit students from Africa into full time engineering roles at Microsoft. This is part of Microsoft’s plan to showcase the talent pool in Africa. For its first iteration, University Recruiting and Africans@Microsoft have selected five universities on the continent to recruit from. University of Nairobi(Kenya), University of Lagos(Nigeria), Ashesi University (Ghana), Makerere University (Uganda) and *University of Cape Town (South Africa). The first part of the selection, the online coding event is to show your coding skills. Students will show their engagement with coding by answering questions formulated by software engineers working at Microsoft. Do complex problems make you thrive? You are intellectually curious and love to innovate and collaborate. Join Microsoft to envision, create and build the solutions and tools of the future. Together, let’s empower billions. This is where grassroots innovation and large-scale engineering coexist. The environment can lead to some fascinating stories. Customer-facing technologist: Use your technical expertise in the planning, execution and communications of program activities. This is the first of it’s kind and will continue when successful. It’ll also be opened to more countries as it grows and continues. Is your university included? What do you think about this move from Microsoft. * I’m still waiting for more details on the University of Cape Town event. – I’ll update as it comes in.